In my office, there is a tradition of having a positive ending to our weekly staff meetings. Sometimes this takes the form of Pictionary but more often than not its rather cake-based. I was warned before I made my first cake to avoid bananas as our finance guy is allergic to them. So it was decided amongst the rest of the office that I should make a non-banana banana cake! The cake itself is a chocolate tray bake from Beautiful Baking by Jane Asher. This was my first 'baking' cookery book and has some really good simple recipes for cakes, biscuits and random stuff like crumpets. 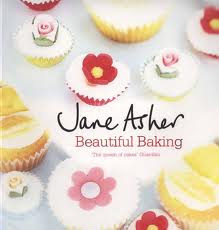 Its pretty much my go-to book for easy but yummy cake. I then coloured some ready-made icing yellow (using trusty Dr Oetker) and covered the cake to make the 'inside' of the banana. I forgot to buy jam to stick the icing to the cake, so improvised with golden syrup! I wasn't happy with the overall bananary-ness of it, so made some half peeled skin using a darker shade of yellow icing. I folded back the tops of the 'skin' pieces to make it look more realistic. Some scored lines down the banana and skin later and tah dah! One novelty cake! This is my very first novelty cake and I am unbelievably proud of myself! Whether the finance guy will feel the same way is another matter!